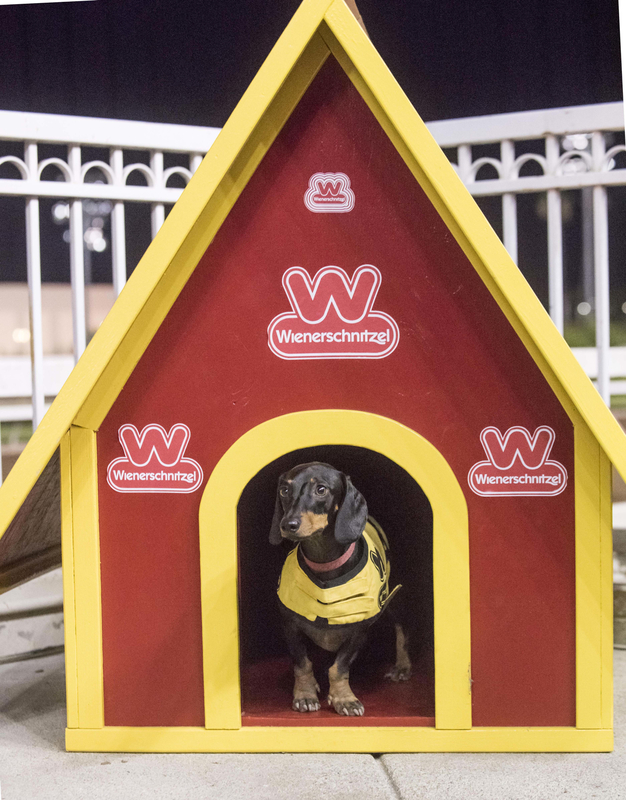 The cheering crowd held its collective breath at the 23rd annual Wienerschnitzel Wiener Nationals as 10 dachsie finalists raced as fast as their short little legs could carry them toward the finish line. 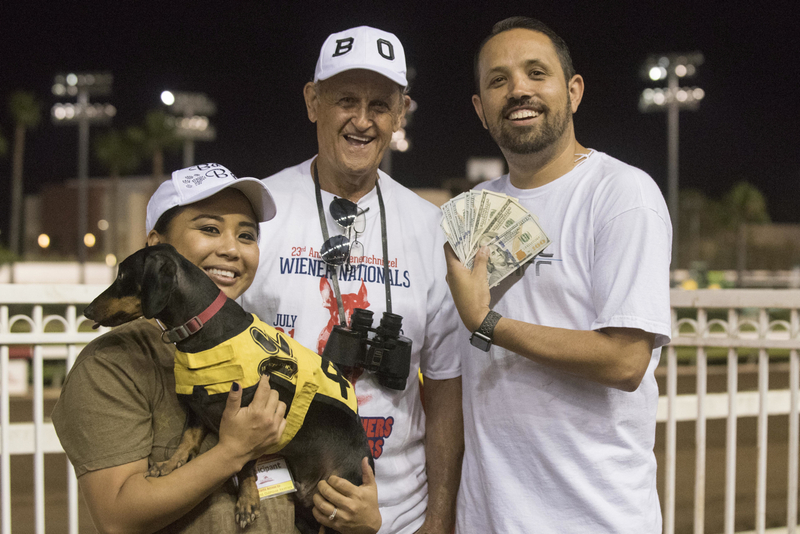 Last year’s winner, Katherine and Eddie Kirshner’s Baby Bo of Newport Beach, became a double-decker doggie champ as he once again took the championship “by 10 sausage-links,” according to Orlando Gutierrez, Marketing Director at Los Alamitos. 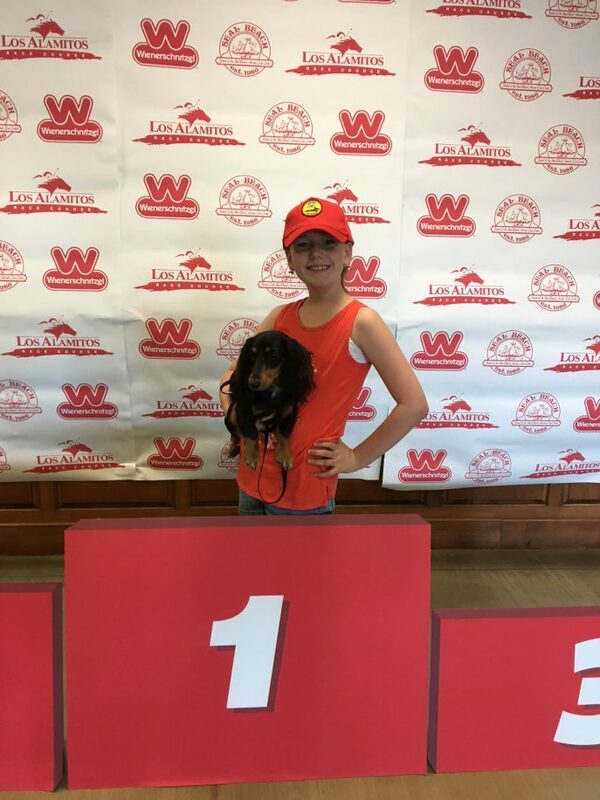 Baby Bo, a 2 ½-year-old black-and-tan dachshund, easily left his rival racers in the dust to win his second championship. Here he is with the Kirshners and a race official. Bo took home a $1,000 cash prize, a trophy and a blanket as well as his second awarded doghouse, which he said he’ll either use as a summer pad or rent out as a bones and breakfast. Photos courtesy of Los Alamitos Race Track. The event was held the evening of Saturday, July 21, at the Los Alamitos Race Course. The winners of the 10 qualifying races included Long Beach local mini-maiden hopeful, 1-year-old Bella “Scoopski” Evans. The lengthy girl scooted her little buns to the finish line with great relish, with a short pause on her short legs to give her closest competitor a nose-up before crossing the finish line. SCRATCHING POST: The cheering crowd held their collective breath at the 23rd annual Wienerschnitzel Wiener Nationals as 10 dachsie finalists raced as fast as their short little legs could carry them toward the finish line. Video taken inside Los Al’s Vessels Club by Cheryl Mathieu. Video taken inside Los Al’s Vessels Club by Cheryl Mathieu. Although Scoopski didn’t win the big prize, Evans said that they were delighted that she’d gotten that far, especially since this was her first time racing. During the championship race, the Evanses had kept their eyes on Baby Bo and the winning tactics that the Kirshners used. 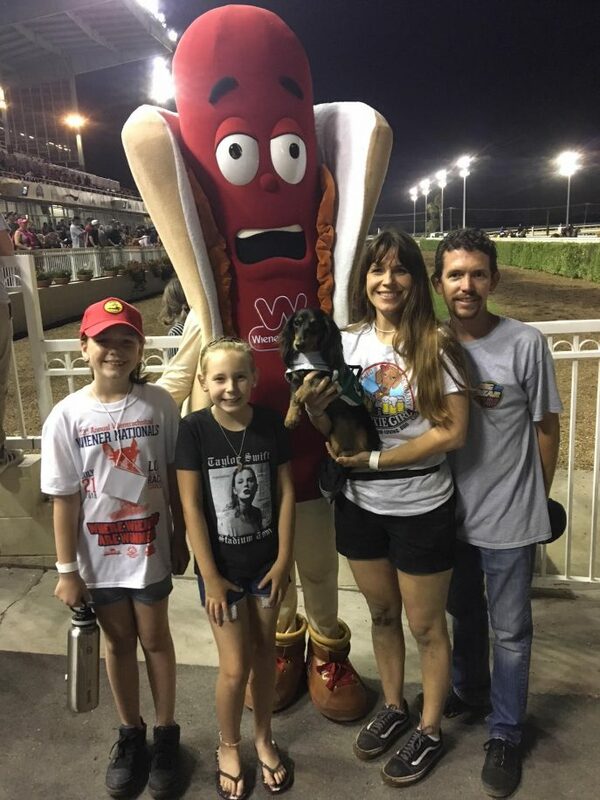 Left: Bella “Scoopski” Evans and sister/trainer Sara in the Wienerschnitzel Wiener-Winner’s Circle in her winning heat; right: Sara Evans, bestie Addison Stevens, Scoopski, Paula Evans, Jim Evans. Rear: The World’s Most Wanted Wiener, who was surely one hot dog in the flame-broiling summer temperature. Photo by Bill Mimiaga. The big winners, of course, are the cats and dogs at the Seal Beach Animal Care Center. The organization will benefit from the funds raised from ticket and T-shirt sales to the estimated 8,500 people in attendance. The Evans family is eager to have Scoopski participate again and contribute to the well-being and adoption of her hopeful counterparts. “We can’t wait to do it again next year!” Evans said.